If you like our French Bulldog stationery then you’ll LOVE these aztec pattern notepads! Now, no one loves animal themed gifts more than us but if you are familiar with our products, then you’ll know that we also LOVE pattern! Inspired by designs you see on Mexican rugs and textiles we created our very own distinctive pattern using a more subtle colour palette than what you would typically see, such as purples oranges, red ands greens. 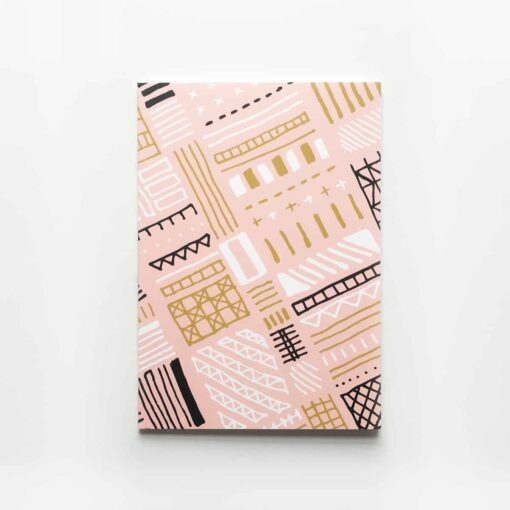 Each notepad has the same fun aztec-style pattern printed in a mixture of pink, gold and black. All are A5 in size and contain 64 unruled pages in each one. The 3 are held together in a pretty belly band and packaged in a clear cello bag.